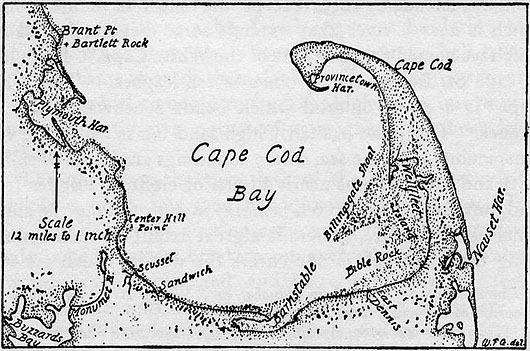 Map based on Champlain's description of Cape Cod Bay by W.F. Gangong, 1911. "The White Cape is a point of sand which bends southward some six leagues. This coast has fairly high sand-banks which are very conspicuous from the sea, where soundings are found of thirty, forty and fifty fathoms nearly fifteen or eighteen leagues from land, until one comes to ten fathoms in approaching the shore, which is very clear. There is a great extend of open country along the shore before one enters the woods, which are very delightful and pleasant to the eye. We cast anchor off shore and saw some Indians, towards whom four of our party advanced. Making their way along the sandy beach, they perceived as it were a bay with wigwams bordering it all around." Visitors can follow the Fort Hill and Nauset Marsh trails to get a sense of what the French saw in the landscape. See reconstructions of Native American settlements.